I have to admit that writing a review for Bumped, proved to be much harder than I originally thought. I don't know what to say about this book, aside from it being so much different than anything I've read so far. After a lot of thought, I decided I generally liked Bumped. Fist and foremost, it is an undoubtedly very original book. I always give credit where credit is due and when I come across a book with an original story, especially nowadays when originality seems to be a lost art, I immediately know that, worst case scenario, it will be an OK book. Is Bumped more than an OK book? I think yes. McCafferty has done an amazing job in building this futuristic, and honestly kinda disturbing, world in Bumped. The lingo she made up kinda put me off at first to be honest, but after the first 50 pages I got used to it and liked it, even.Told from the POV of twin sisters, Melody and Harmony, on one hand you have the progressive, pro "bumping" world Melody lives in. In a nutshell, a world where teen girls' reproductives systems are being bought by wealthy families who want to have a baby. Needless to say, the girls never get to see their babies, as they are snatched away from them from them moment they are born. Think of it as "wombs for rent", or something like that. 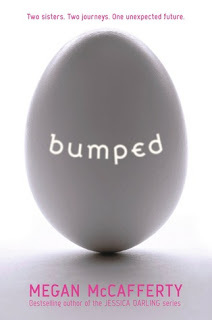 It's a world where bumping is not only a given, but also encouraged by the society and media. Not having been bumped is of course frowned upon. On the other hand, you have the religious, "bumping is a sin"-world Harmony lives in. Harmony grew up totally ignorant of the outside world and the progress of technology. Her main goal is to preach God's word, in the hopes of saving as many souls as she can, especially her sister's. Now, it's pointless to weigh the pros and cons of each world, as I honestly wouldn't want to live in either of them! And that is Melody and Harmony's main moral dilemma, I think. They both know that they can't take the oppression any more and want to escape their worlds, but realise there is nowhere left to run. Even though I think the characters where likeable enough(I struggled a bit with Harmony at first, but as I read further I came around), I couldn't bring myself to care deeply for any of them. I can't pinpoint exactly what was it that put me off about these girls. Is it Harmony's overzealousness to bring everyone to the path of righteousness, even though she herself is unhappy? Is it Melody's non-chalant behavior even though she suspects there is something wrong with the way of the world? Can't really say. All I know is that Bumped will surely get you thinking about it a lot after reading it. I would like to have been given more info on the virus that makes it impossible for girls to reproduce after the age of 18. What caused it, when it all started, dates. Come to think of it, I am pretty sure no date is mentioned in the book. So we don't really know when exactly the story takes place. I maybe wrong though, I can't remember. If you like books with a controversial theme, books that make you lay awake at night wondering "what if? ", then Bumped is definitely the book for you! PS.Beware of the ending, because it would leave you gaping, wanting more.Bumped #2 comes out sometime in 2011. I'm still not 100% sure how I felt about Bumped! @Karen You know I was pretty torn after I read it. But then when I couldn't get it out of mind, I realised that's gotta mean something.Hence 4/5. I remember seeing a couple of dates. I read the Kindle version and tried to do a search but could not find the exact spots. I was thinking that it was around 2035 or so. I wish I could have found it again to say for sure. I had not heard when the sequel was coming out. I am glad that it is soon!